Our Board of Directors are all unpaid military veterans who volunteer their time, skills and energy to assist the veterans of Mohave County. A practiced leader of a Non-Profit organization with the mission of assisting Homeless and at-risk military veterans and their families. Pat has spearheaded the first ever and ongoing At-risk Veterans Stand Downs for the past four years. The 2015 Stand Down included 78 service providers and 130 volunteers. Pat has organized agencies as varied as the Veterans Administration, Arizona State agencies, Mohave County agencies, private companies and various organizations and individuals that provide services to our veteran population. Pat has been the major fund raiser for these Stand Downs collecting over $750,000 in cash donations, In-kind donations and volunteer donations. Pat is also a member of the Arizona Veterans Hall of Fame, President of the Vietnam Veterans of America Chapter #975, AZ State VVA Vice-President, Incarcerated Veterans Program Coordinator, and belongs to the VFW, American Legion and Elks. Pat retired from the US Postal Service as a Postmaster. Other relevant positions were with the AZ DES as a Disabled Veterans Program specialist and with the MTC Corporation as an Inmate Job Coordinator. Michael is a 4 year veteran of the US Marine Corps, serving from June 1974 to June 1978, and the son of an Air Force Veteran of 26 years. Michael served on board various Navy ships in the Pacific during the evacuation of Vietnam in 1975. He has a Bachelor of Science Degree from West Virginia University in Business Administration /Accounting. Michael has worked in many areas of business and accounting over the last 28 years. He holds an Enrolled Agents License issued by the Internal Revenue Service and holds a Certified Assisted Housing Manager Certification issued by HUD. He has used his education in business and accounting to assist veterans and veteran’s organizations with various business, accounting and tax issues. Michael volunteers his time to assist the Jerry Ambrose Veterans Council and other veteran organizations with accounting and tax issues. He has been a member of the Jerry Ambrose Veterans Council for two years. He is a small business owner of a tax and accounting firm Bullhead City, AZ. Doreen graduated from UNLV with a BA in Accounting. She has resided in Kingman for the past 21 years and was employed by 4 large construction companies performing tasks that included construction accounting, cost accounting, estimating and customer service for 13 years. Doreen also owned and operated her own construction company “On the Wall Lath & Plastering” for past 6 years. In 2015 Doreen changed her career path to a position with Kingman Aid to Abused People (KAAP) as a Victim Advocate Specialist working with sexual assault victims, domestic violence victims and the homeless. She is a proud mom with 4 amazing children. Charlee has lived in Kingman AZ for the past 22 years. She is a retired United States Air Force (USAF), Chief Master Sergeant and was a paralegal after 25 years of service. Charlee is also retired from Arizona State, Child Support Enforcement after 12 years on the job. 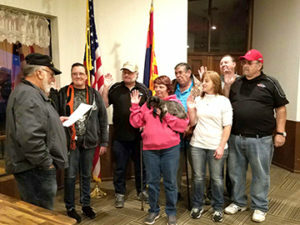 Currently she volunteers time as the Women’s Program Chairperson for the Jerry Ambrose Veterans Council (JAVC) of Mohave County. Charlee started from the ground up in 2012 after the Stand Down where only four (4) women self-identified themselves as veterans. Since that 1st Stand Down we saw the need to have a woman veteran to address the issues of military women to include active duty, veteran, wife, family, etc. In 2013, the Women’s Program reached out to women with me as the lead. This learning experience now shows progress with an ever increasing number of women stepping up during our Stand Downs: 2014-17, 2015-28, and 2016-38. Today, our Women’s Program works daily to assist military women members in meeting their needs met that they deserve. Paul was a Staff Sergeant, Strategic Air Command, and Combat B-52D bomb wings, having served during Vietnam as a senior maintenance crew chief. Paul is a retired Fire Chief and Medical Reserve Corps Unit Coordinator for Mohave County Public Health Service. Paul is the Lead Chaplain for the Vietnam Veterans of America, Chapter #975, the JAVC, and the U S Air Force Volunteer Auxiliary. Paul is also a member of Patriot Guard Riders. Paul has a College Degree 1968, Paramedic Training 1975, and a Master’s Degree 1989. Work Experience Full Time: Firefighter/Paramedic – over 18 years, and then Fire Chief of Fire Department with 6 stations. Contract employee Cal Fire & US Forest Service Wildfire Management teams – 4 years; also worked for Mohave County Department of Public Health Bio-Defense Division & Emergency Response team – 8 years. His Management Experience includes: Emergency Incident Command and Management for Fire, Emergency Medical Services and Disaster Responses. Paul’s Awards include: During Vietnam Combat Service – Meritorious Service Medal, Combat Readiness Medal, and USAF Outstanding Unit Award with V, USAF Good Conduct Medal, Presidential Unit Citation, USAF Longevity Ribbon, National Defense Service Medal, and Vietnam Service Medal with 4 Bronze stars, Vietnam Unit Cross of Gallantry Award, Vietnam Campaign Medal, and Expert Marksmanship Ribbon. They also include the Council of Native American Nations – Warriors Medal of Valor; Fire Service Chief Officer, Excellence in Leadership – 1992; Presidential Volunteer Service Award – Mohave County Medical Reserve Corps, Awarded twice (2007 and 2009).